The folks over at Cruzerlite have always been generous in handing out free swag to the Android community. Once their original Androidified cases went viral for the Galaxy Nexus, they have managed to grow into a fully blown case company that supports more devices than I can even keep track of. Their custom made TPU cases for a variety of devices add a bit of flair where other accessory makers tend to play it safe. From graphic-laden cases with ROM developer roots to their ultra-protective Spi-Force designs, anyone looking for a case will have no trouble finding something of Cruzerlite’s that is appealing and affordable. As a reminder, all of their products can be found on Amazon, along with a “buy 2 cases get 1 free” promo. All you have to do is use the coupon code “BUY2GONE” at checkout to get the deal. Also, Cruzerlite has their own site, which features Android-inspired t-shirts, plushies, beanies, and other goodies. But before you go shopping for cases, how would you like to win one? 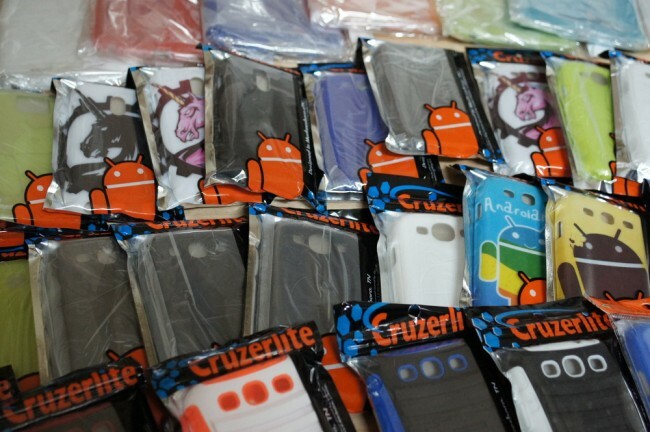 We have over 30 cases to hand out – some for the Galaxy Nexus, Galaxy S3, RAZR HD, and Nexus 7. It’s a case blowout, that’s for sure. Ready to win? Update: We have picked our huge list of winners and they have all been emailed. Check your spam folders too! Thanks to everyone who entered. 1. First, tell us which type of case you would like (specify device too). 2. Second, tell us which of these Cruzerlite plushies (Amazon link) you like the best. *Since we have so many cases, we are handing them out by type rather than specific design. So when you win, it’ll be a mystery when you open the package. Some have graphics amd some are Androidified in a variety of colors. Tomorrow at noon, we will select the 35 winners. Three of the winners will also win Android plushies as a bonus. Good luck! And thanks again to Cruzerlite for hosting the contest!